An idea for a snorkeling excursion for those who remain in Cancun is the Submarine Museum in Cancun. 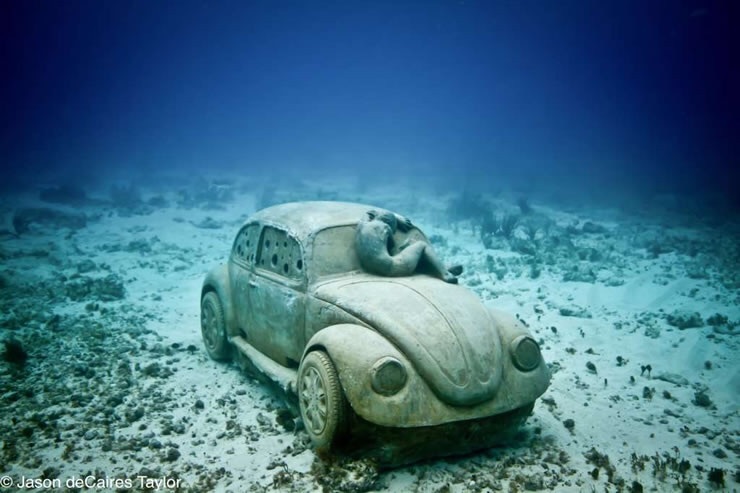 This tremendous achievement is the work of Jason deCaires Taylor, a British sculptor who carved 400 statues to inform tourists on the importance of protecting the barrier Reef, and so far the mass tourism of this ecosystem still allows it to regenerate. Made from alkaline cement out of fiberglass and various resistant and environmentally friendly substances, these immobile beings are immersed at different depths and then become artificial reefs where the fire corals can grow. Following are that statues that will last with their full dimensions, the ones named “Man of fire”. “The Flower of Hope”, “Silent Evolution” … All the works were inspired by members of the local community and follow the evolution of the Mayan culture.